Visited Backwell Lake near Nailsea, Somerset late afternoon as I was passing. This is always a busy place as many people go to feed the gulls, swans, geese and ducks. 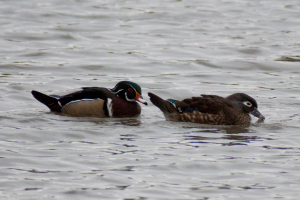 Never seen Wood Ducks there before though - have "enhanced" the picture somewhat to show colouring and markings - taken in poor light. My Collins guide published in 2004 suggests 20 to 30 pairs breeding in the UK, mainly in central southern England. Curious as to what the population may be now and how widespread they are. BirdGuides has reports of a bird or birds in Shetland in 2009 which I presume were North American vagrants as opposed to being feral.